Depending on the weather it’s likely the leaves will be abundantly falling by the end of the month. Time to pop the collector on the garden tractor and sweep them off the lawn. 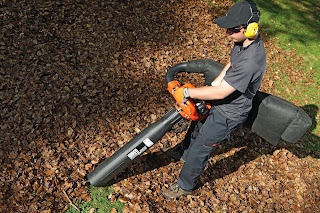 Or you can use a powered blower/vac to pick them up, a blower to pile them up into a heap or simply gather them into small heaps with a spring tined rake. Either way you want them off the lawn and flower beds where they will be covering winter plants. But leaves are good in the right place – gathered into a plastic bin liner or composting bag, or in a composting bin where they can rot down to leaf mould for composting your borders. It’s a good time to aerate the lawn with a fork or spiked roller, again there’s an attachment for the garden tractor for the purpose, to relieve areas that are compacted. Worn patches of grass can be repaired with fresh turves. Simply cut out an area using an edging tool, spade or a turf-lifting tool and cut a new piece of turf to go in. If you lay a number of turves, remember to stagger them like bricks in a wall so the joints don’t come together and leave gaps. Raking with a spring tined grass rake will lift moss and worm casts can be swept with a birch broom.